The Buff Duck Breed was developed by the William Cook family who lived in the Orpington area of Kent, England in the early 1900s. It was developed as a multipurpose bird, with the ability to lay good quantities of eggs along with having the size and feather color to make a good roasting duck. Some even claim that the buff colored feathers are easier to pluck than the white Pekin feathers. 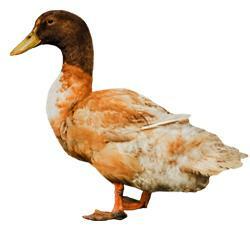 Though the Buff Duck Breeds true (progeny have the same color as parents), they originated from a variety of breeds. W. Powell-Owen described this breeding program in 1918 "Runners were mated to Aylesburys, Runners to Rouens and Runners to Cayugas, and the progeny were crossed with one another until the buff plumage was secured." They entered the United States in 1908. Interestingly, they are the only poultry breed admitted in the American Standard of Perfection with their name as a color only. Orpington should have been used to describe the breed and Buff for the variety. They remain a very beautiful and popular breed.